Telephone systems are transforming the way that businesses operate and no more so than in the hotel and hospitality sector. These days it’s not only the business traveler that takes their mobile telephone away with them, a trend that has completely changed the whole requirement for a hotel telephone system. Choosing the right telephone system could be one of the most critical business decisions that you make. This is because an effective telephone system could enable you to deliver a best in class customer experience for your guests, offer added value services and reduce your running costs. The simple fact is that whether you are a large chain or specialist boutique hotel, a guest house or a bed & breakfast, today’s guests expect so much more! For the switched on hotelier this represents a wonderful opportunity to build customer satisfaction, loyalty and powerful recommendation in every interaction and experience that they deliver. What a phone system can do for your guests. Today’s specialist hotel telephone systems are designed to be seamlessly integrated into CRM, PMS or other Front of House software. This enables many day to day tasks to become automated and integrated into your systems, leaving staff free to spend more time looking after your guests. Be it the ordering of food and drinks, listen in and ‘baby monitoring’, wake up calls, and simple one touch services for the restaurant, gym, spa, or golf centre, so much more can now be done from the handset in your guests rooms. And for that personal touch, your customer’s name can be displayed with each service call that they make, enabling your teams to greet them by name as each call is answered. Multilanguage to enable your regional and multi-national guests to use your telephone system with confidence and ease. Conference Calling facility to provide for the needs of your business clients. Direct Dial whereby a guest can chose to allow external callers to dial directly to their room. Privacy Mode enabling your guests to put their phone onto ‘do not disturb’ mode to block any calls from coming in or perhaps diverting these directly to their private voicemail (this can be overridden should an emergency scenario arise). Private Voice Mail boxes for your guests ensuring messages from missed external and internal calls are highlighted by a flashing lamp on the telephone handset. Message retrieval and returning calls is nice and simple, at the press of a button. Room to Room dialing so that groups and parties can easily stay in touch – and what is more this can be set up by reception or blocked should the need arise. Hotel services recordings can be a convenient and unobtrusive way for guests to listen to the array of treats and services available to them at the hotel and perhaps in the local area, potentially enhancing their stay. Listen in and child monitoring services to enable guests to monitor their room from other parts of the hotel. Wake up call which can be set by your guest from their phone or perhaps organised by the front desk. You can chose to deliver a pre-recorded wake up greeting or if preferred schedule a call with the night porter or early morning receptionist. Weddings, event management, conference and venue have become an essential part of today’s portfolio of services offered by many hotels. With this change it is estimated that 80% of employees in the hotel and hospitality industry are now mobile. This in turn has made the challenge of providing a best in class customer experience even more demanding. At the heart of this is the ability to contact key members of staff. Be it the events team manager or the estates team, the night porter or the general manager, speed of contact can make the difference between a good or bad customer review. Today’s telephone systems make it much easier for guests and management to contact not just 20% but 100% of the hotel team, wherever they might be. Room status can be easily checked from the front desk to see if it is ready for your guest to check in or still awaiting housekeeping. The status of the room can be updated via the phone in the room, allowing reception to keep guests informed and offer an early check in if available. Integration in to CRM/PMS including Tiger for example, enabling best possible customer interaction and the ability to deliver tailored marketing promotions and messages. Mini bar charges can be input into the system via the guest’s phone in their room. Routing of calls via the most cost effective carrier allowing hotels to make more profit on your guests outgoing calls. One touch dialing for hotel services such as restaurant and bar, spa and concierge, making it easier for your guests to use your revenue generating services. Barring of phones in vacant rooms upon check out, restricting external use but still enabling housekeeping use for room updates. Business phone to mobile phone twinning and smartphone apps integrated into your telephone system means every member of your staff can be contacted anywhere, on or off site. Even if the caller has called the office telephone number. Voicemail boxes for all of your staff with the ability for voice messages to be delivered to an email address for your more mobile team members. DECT and WiFI handsets enabling the night porter, security, the IT manager to carry their handset around the hotel with them providing faster and better service. Unique distributed architecture enabling the phone system to be distributed to all areas of the hotel complex, including separate buildings, without the need for expensive re-cabling. SIP trunk connection to dramatically reduce calling costs and uplift profits from customer calls. A new telephone system, integrated into Front of House systems can completely transform the way that a modern hotel operates, enhancing the customer experience, delivering new efficiencies and saving on running costs. Ability to monitor call volumes, handle overflows and identify training opportunities in their reservations office. Modular product – can swap out modules in the unlikely event of failure, ensuring continuation of business. Good support system – can be maintained remotely. Wake up calls – the system alerts them when guests have not answered a wake up call so they can take action. Housekeeping can change status of room via the in-room phone. 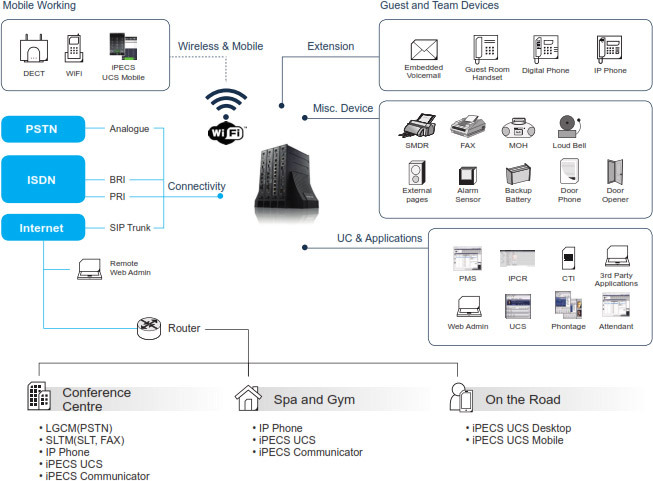 Connectivity to the hotel for guests – allowing them to access info and services, which drives revenue. Easy to use phone which is attractive in the room. Evoke Telecom are proud to recommend Europe’s number hotel telephony solution – the Ericsson-LG iPECS. 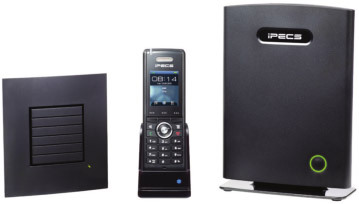 The iPECS not only offers the GREEN benefits of one of the world’s lowest power consumption telephone systems but will also deliver a whole host of modern features to provide the best possible experience to your guests. The iPECS’ features are designed to help you enhance your guests’ experience, increase your revenue streams, improve staff efficiency and productivity and reduce operational costs. Our brochure explains how all of this and more is achieved. Click here to download our iPECS for Hospitality brochure. Why choose Evoke to help your hotel? We specialise in specifying, installing and supporting phone systems for hotels and hospitality – so why not call our helpful and friendly sales team now on 0800 8403688 or 01509 278278 and find out how we can help.